Somebody wanna explain the picture to the blind man? LMAO! That's hysterical! Love it! That's hilarious! Thanks for posting! 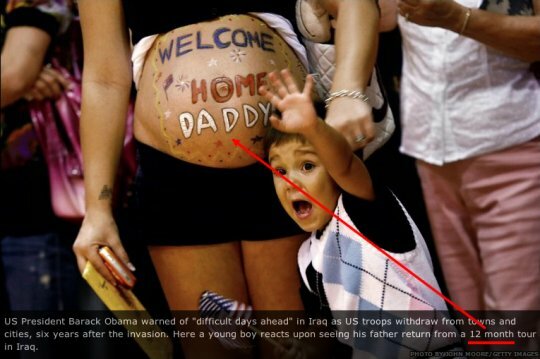 It's a news photo of a pregnant woman and what looks to be her son welcoming home US troops. The pregnant woman has "Welcome Home Daddy" written on her belly. The caption reads "US President Barack Obama warned of 'difficult days ahead' in Iraq as US troops withdraw from towns and cities, six years the invasion. Here a young boy reacts upon seeing his father return from a 12-month tour in Iraq." I suppose there's always the outside chance that it's her dad coming back, but it's funnier the other way. However, could be that the boy has nothing to do with the pregnant woman. And, what's written on the belly refers to what the unborn baby is saying to its daddy who is returning from a shorter tour than 12 mos. Sorry, don't mean to ruin everybody's fun. I know there are HTML things for helping with these images for blind readers. I often remind myself to use the "ALT" attribute in the img tag for this. There's also LONGDESC, but I don't know much about that since my HTML knowledge is almost entirely from 1996 (despite writing PHP from 2001 up until now even). They do get leave and it could've happened then. Obviously there's an explanation beyond "She cheated on him" but it's still a funny picture/caption combo.